Don't assume your ancestors didn't get divorced because there isn't a divorce case for them in the area courthouse. Your ancestors may actually have gone to another state to file for divorce, either because it was easier to obtain there, or because there was less chance of them being recognized. In the 1800s and early 1900s, certain states got a (bad) reputation for being a divorce "mill," because they would grind out divorces at an alarming rate. Their divorce laws were not as restrictive (e.g. they allowed more grounds for getting a divorce or didn't require strict proof of residency) or the judges didn't always enforce them. They were easy to get to by train, which had started to connect the country by the 1840's. All the businesses that were near the courthouse - including lawyers, hotels and restaurants - benefited from the extra visitors and they sometimes advertised in other states' newspapers. Beginning in 1830, there was a residency requirement in order to file for divorce in Indiana (between 1 year and 2 years). However, according to The History of Indiana Law (2006), in 1858, two-thirds of all the divorce cases in Indianapolis were actually filed by someone from out of state. That may have been because Indiana judges were also given "discretion" in laws passed in 1838, 1849 and 1852 to waive the requirements if they felt the circumstances warranted it. The tide began to turn in Indiana in 1873. The judge's discretion was removed, residency requirements were tightened, and newspapers had to publish legal notices of the divorce filing for 3 weeks before any action could be taken. In 1881, they made it a crime (punishable by a $100 fine) to distribute any pamphlets, newspapers, etc. that called attention to the ability to obtain divorces in Indiana. And beginning in 1901, Indiana would not grant an uncontested divorce - any defendant who did not show up in court would have their interests represented by the county prosecutor. According to statistics compiled by the U.S. Census Bureau, there were 25,193 divorces granted in Indiana from 1867 to 1886; 60,751 divorces were granted from 1887 to 1906. Indiana's population grew by 60 percent in that half century, but its divorce rate had grown by 157 percent. 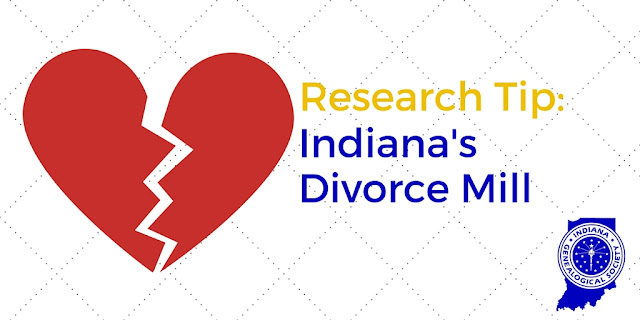 By 1900, 1 out of every 5.7 marriages in Indiana ended in divorce - a higher rate than surrounding states. Want to look for an Indiana divorce? You may want to start by looking in Indiana newspapers, some of which have been digitized and can be viewed online for free at the Hoosier Chronicles website. The Indiana State Library also has microfilm of many county's newspapers - your local library can request it via inter-library loan. And some Indiana newspapers have been digitized and are available through a subscription to a premium site (e.g., Newspapers.com or NewspaperArchive.com). You can also look for evidence of a divorce case in the court order books of Indiana counties. Many counties' pre-1920 court order books have been microfilmed and can be rented directly from FamilySearch. Search their catalog here.